Assessment of Life Skills – How?…. Since teaching a Life Skills curriculum, I have always questioned how we go about recording students’ progress to allow me to track this more accurately. What is it that we are trying to measure? What would we like our students to achieve from their lessons? As the curriculum we deliver is quite unique, I have yet to come across any guidance regarding subjects we teach apart from accredited vocational qualifications. I+ – Independence with confidence. We felt that the distinction between independence and independence with confidence was difficult to judge and that by including support minus this allowed us to clearly assess students on the progress they had made. In addition to these grades we write qualitative statements detailing milestones they achieve in the lesson and any other info that is relevant and adds value to the grades. Though this has been a step forward from previous assessments, I still felt that tracking students’ progress over the course of three years was difficult and wanted a more quantitive way of doing this. Over the course of the term this system has allowed me to successfully track progress made by students. It also ask gets me to ask questions about those students who might not have made asgood as progress as expected. At the moment my TAs and I are responsible for the assessment of students and we have discussed in depth what each grade would look like for each objective. The next step is to write level descriptors so that this can be shared across the department. Students might not be able to demonstrate every objective each lesson. 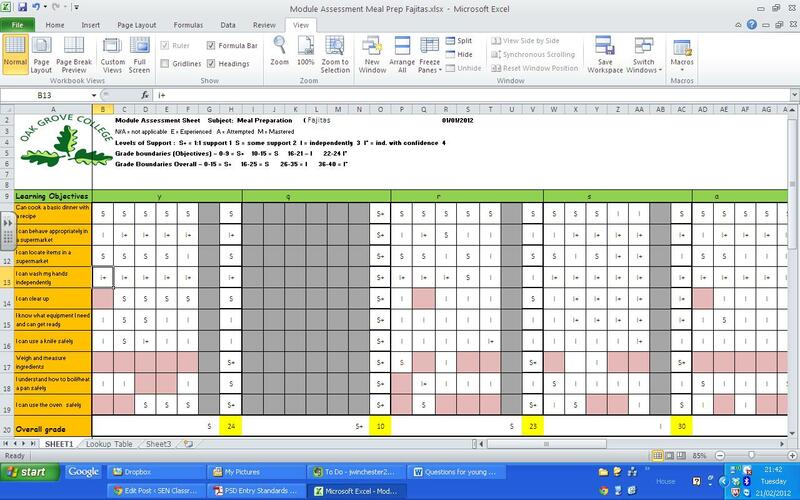 At present, the system is very objective and still based on the assessors’ opinion until grade descriptors are written down. I know the system is not perfect, but at present it seems to be working. It has given me a much better understanding of the progress that students make across the year so far and I believe will be useful when tracking progress over 3 years. I would be interested to hear how other SEN 6th Forms are tracking students’ progress in Life Skills and how they go about assessment. Thank you for taking the time to read and please comment on the post – all feedback is greatly appreciated.